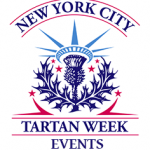 Home Uncategorized Kelpies Coming to Bryant Park! 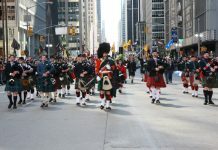 In the first major event of 2014’s Tartan Week season, two dramatic horse sculptures will arrive in Bryant Park on March 22. They are 15-ft-tall scale models of Glasgow-born artist Andy Scott’s ‘The Kelpies,’ the 100-ft-tall steel horse heads – the largest equine sculptures in the world – that are the centerpiece of the £43 million Helix land transformational project in Scotland. Located between Falkirk and Grangemouth, the massive horses are just 30 minutes’ drive from Glasgow and Edinburgh. In comparison, the models (called the Maquettes) will be in Midtown Manhattan, at 42nd St and Sixth Avenue, until April 22nd. 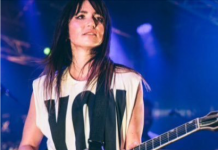 A program of lunchtime concerts is being planned around them, with details to be announced. The Kelpies’ arrival in Bryant Park is a partnership between the Helix Project, the City of New York Dept. 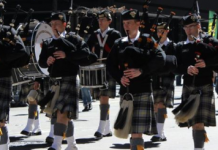 of Parks and Recreation, the Bryant Park Corporation, and the American-Scottish Foundation. 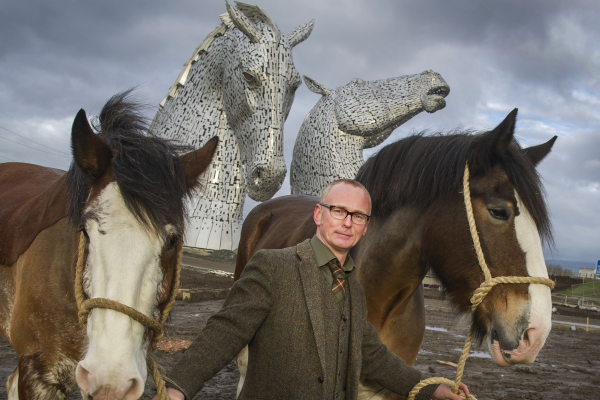 Scottish sculptor Andy Scott, pictured with Duke and Baron, the Clydesdale horses that were the inspiration for The Kelpies. 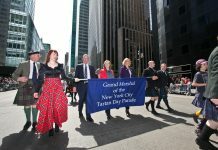 Previous articleWelcome to Tartan Week 2014!